Any golfer thinking of buying New Irons or replacing his old set should go for the New Idea from Adam Golf. It is a modern golf club set that uses the latest technology to make sure that golfer gets the best experience when on the course. The wrap-around slot is one of the main features of the clubs, and it is also one of the reasons why golfers love them. This technology is unique, and it increases the sweet spot by 23% for center shots and by an impressive 44% for the off-center one. The Cut-Thru Sole on the Hybrids is what gives the balls an incredible speed, and it also improves the launch. Any golfer thinking of buying New Irons or replacing his old set should go for the New Idea from Adam Golf. It is a modern golf club set that uses the latest technology to make sure that golfer gets the best experience when on the course. The wrap-around slot is one of the main features of the clubs, and it is also one of the reasons why golfers love them. This technology is unique, and it increases the sweet spot by 23% for center shots and by an impressive 44% for the off-center one. The Cut-Thru Sole on the Hybrids is what gives the balls an incredible speed, and it also improves the launch. 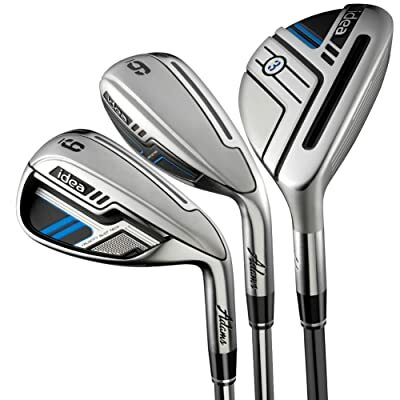 These clubs have a low COG and graphite shafts which provide them with a fantastic performance and durability. Their multi-textured grip is also firm on the hand and comfortable even when you swing the clubs for extended periods. Wrap-around Slot: The wrap-around slot is one of the things that set this irons set apart from others. It is one of the highlights of these Irons, and the manufacturer claims that their technology increases the sweet spot by an impressive 44% so that golfers never have to worry about miss-hits. Cut-Thru Sole: The Cut-Thru Sole is another impressive feature on the Hybrids, and it improves launch and gives the ball an incredible speed. Low COG: All Golf Iron manufacturers work hard to lower the COG on their clubs, but few are as successful in doing so as Adams. The irons have an amazing weight distribution and design that lowers the center of gravity to make sure that the clubs always have a higher launch. Shaft: Both the Hybrid and Irons on the set have graphite shafts, and so you can be confident of impressive performance and durability. They are also available for both hand orientations and regular or stiff flexes. Grip: The irons have a multi-textured grip which most golfers will love and will make them look forward to swinging them. This grip design is also very comfortable on the hand, and so golfers can swing them for several rounds. What Cubs do you Get: New Idea is a complete set of irons which includes the 7h, 6h, 5h, 4h, 3h, 8-iron, 9-iron and the PW. With such a variety of clubs, you can be confident of plenty of options for the loft and lie. 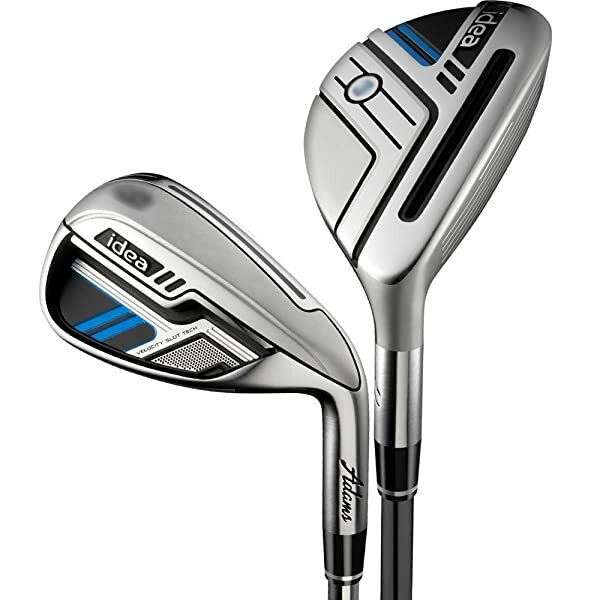 It is a progressive set of irons and hybrids that blend well. The springy face will not wiggle on impact as it is with a steady head. You get impressive yardages even when you make miss-hits. Any hit anywhere on the face still feels solid. The excellent blend of forgiveness and accuracy makes these some of the best irons on the market. They have a unique wrap-around slot that increases the size of the sweet spot. Their design ensures that golfers get forgiveness and speed where it is needed most. The multi-textured grip is comfortable and ensures that you get a perfect hold of the clubs. If looks matter to you, these Irons will impress you because they have a stylish overall appearance. 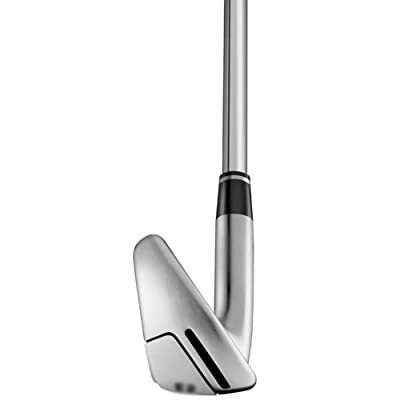 The irons would perform better and impress more golfers with a distance boost. Lack of precision on scoring shot is a great shortcoming for the short irons. The rounded top line will give some golfer (mostly beginners) alignment trouble. Traditionalist will not find the hybrid appearance pleasing. These Irons will take beginners some time to get used to them. Irons are the clubs that golfers use most when playing this fantastic game and so you should make sure that you only buy the best. Several things define good Irons, and they can vary from one player to the other, but playability and accuracy are among those that golfers give the highest priority. The fact that New Idea is a blend of accuracy and forgiveness is enough to show you that it is an excellent set for golfers of different calibers. This set comes with all the irons that you might need, and this is regardless of the level you are playing, and their lower COG gives them a higher launch which is what most golfers look for in an Iron Set. Miss-hits should also not trouble you because the irons have a large sweet spot and so you still get impressive yardages regardless of where you hit. But, you should also not ignore the few complaints that some players have raised. However, they are minor things that cannot change the fact that this is a top notch Iron Set.